The Chinese yuan is weakening on Tuesday after economists slashed their gross domestic product (GDP) estimates amid the escalating trade war with the US. The yuan’s declines were capped on stimulus measures employed by Beijing to spur growth and limit the trade war’s effects on the economy. According to a survey of economists by Bloomberg, the GDP for the world’s second-largest economy is expected to increase by 6.4% on a year-over-year basis in the fourth-quarter of 2018. The economists also anticipate a 6.3% jump in the first quarter of 2019. The results of the survey come as GDP growth slumped to 6.5% in the July-to-September period, down from 6.7% in the April-to-June time frame. This was the slowest pace of economic expansion since the Great Recession in 2009. The yuan’s drop was capped by new stimulus efforts by the federal government. This week, the banking and insurance watchdog confirmed that it will release new measures to encourage financing to the private sector. The government will also push financial institutions to continue lending to businesses even if they are facing temporary difficulties. Local reports also suggest that officials are considering instituting a 50% tax cut on automobile purchases to rejuvenate the sluggish market. Last week, it was reported that national car sales fell this year for the first time in more than 20 years. Leaders have said that they want to complement government stimulus with policies that promote the private sector. The US-China trade spat still has limited impact on Japanese steelmakers’ business, but we are concerned about signs of a weakening economy in China. 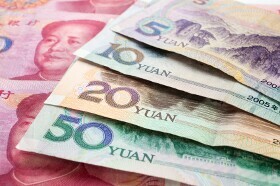 The USD/CNY currency pair rose 0.08% to 6.9673, from an opening of 6.9619, at 17:43 GMT on Tuesday. The EUR/CNY tumbled 0.28% to 7.9041, from an opening of 7.9265. If you have any questions, comments, or opinions regarding the Chinese Yuan, feel free to post them using the commentary form below.